Humphrey fell out of the cage! I was snoozing away during the night when there was a commotion next door. I heard someone flying through the air and landing on the floor with a thump. It was Humphrey! I don’t know what he and Hector had been arguing about. Who sits in Humphrey’s grassy hutch probably. But Humphrey was on the floor and it all went very quiet. Mummy camne down as normal in the morning and said hello to each of us. She usually puts her finger near us and we reach out to sniff it as a greeting. She said hello to the three of us. Then she said hello to Hector. Then she put her finger at Humphrey’s grassy hutch and he didn’t come out to sniff it. So she put her finger at the other entrance and he wasn’t there either. Then she looked in and saw he wasn’t there. So she tried the snuggle tunnel. And he wasn’t there either. I could see her look all round the cage to check he wasn’t there. Not even under a pile of hay. Then she looked down at her feet and saw Humphrey among the tents. She asked him what he was doing down there and gently picked him up. I could feel Humphrey was very relieved to be found. Mummy checked him over and took him for a cuddle. And apparently she didn’t find anything. He ate his grape as normal, so she put him down on the floor and did the rest of us. Well, when I got down on the floor I could tell Humphrey wasn’t well. He didn’t want to speak to me. He had eaten a little hay but was just lying on it, resting. I didn’t know what to do really so I left him to it. Then Hec came down and he didn’t know what to do either so we had a chat and let Humphrey sit in his green box on his own. I hope Mummy knows what to do. A to Z Blog Challenge starts on Sunday! How is Humphrey today? I hope he is better. 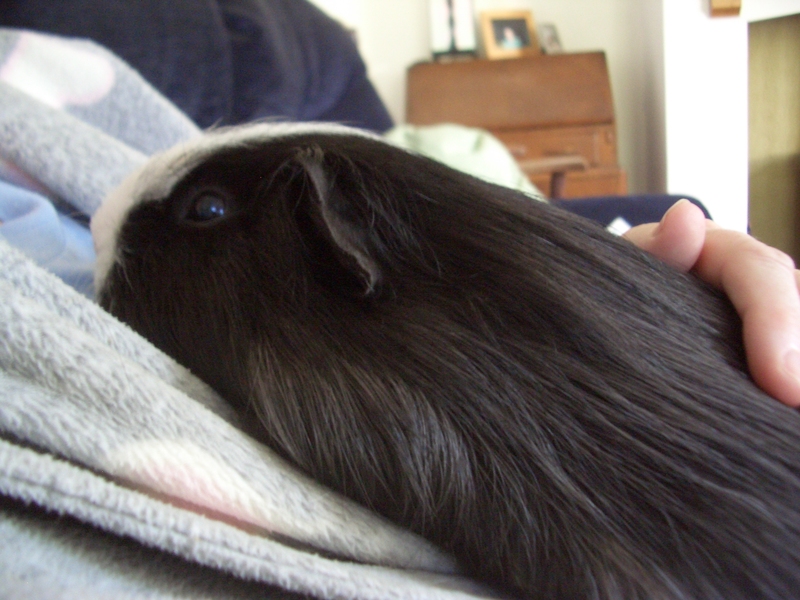 I love Guinea pigs..I am so excited to have found your blog.